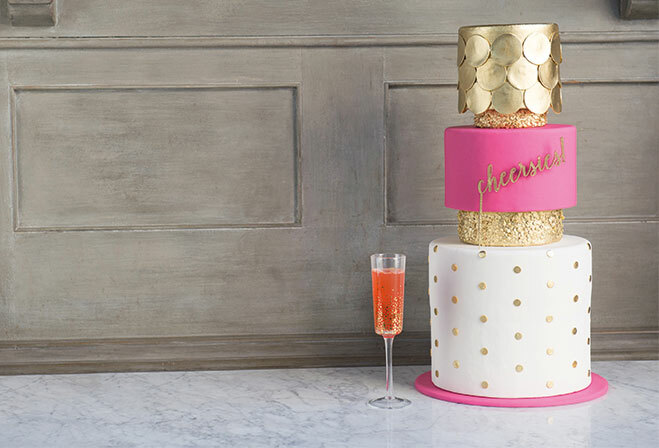 Inspired by Kate Spade’s mantra, “Live colorfully,” Superfine Bakery’s Andrea Boudewijn channeled the fashion designer’s signature whimsy and sparkle in the creation of her Champagne-flavored Champs-Élysées cake. The joyful cake boasts oversize sugar gold paillettes on the top tier, risers covered in edible gold sequins, a bright pink middle tier and a tall base tier covered in neatly ordered gold polka dots. The “Cheersies” cake topper is playfully situated in the middle of the cake. The cake’s interior is layered with house-made strawberry compote and strawberry purée buttercream, which pairs elegantly with Good Gracious! Events’ sparkling cocktail featuring Campari, St. Germain elderflower liqueur, blood orange juice and Prosecco. Showcasing a wedding dress in the decor is an unforgettable detail. 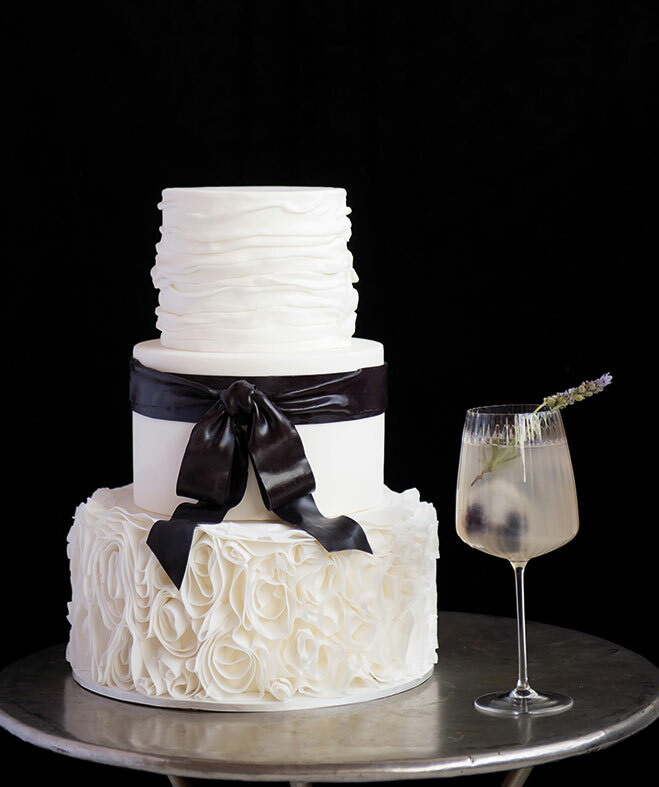 Frost It Cakery’s white velvet cake, filled with blackberry compote and white chocolate ganache, is enrobed in a fondant design reminiscent of Vera Wang’s classic Ghilian wedding gown. A textured top tier pays homage to the gown’s asymmetrical bodice, while the ruffled bottom tier mirrors the chrysanthemum organza skirt. A hand-sculpted black fondant bow finishes the look. Good Gracious! adds an elegant note with a blackberry lavender cocktail that is a bright yet delicate blend of Hendricks gin, peach purée and Tondo cream of white balsamic, finished with soda and fresh lemon juice. 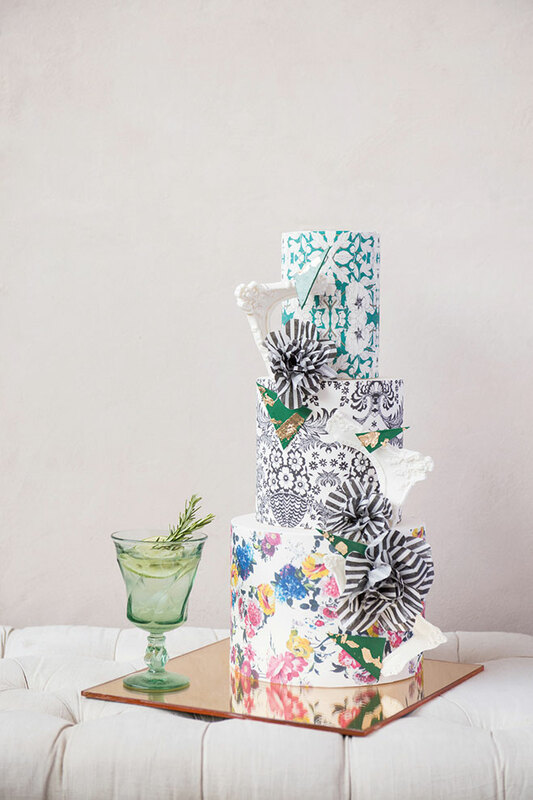 Stevi Auble, known for her creative use of wafer paper, conveys the vibrant and modern attitude of Alice and Olivia by wrapping each tier of this vanilla bean cake (layered with passion fruit curd and pink champagne buttercream) in bright, floral and toile custom patterns printed on edible rice paper. Delicate black and white flowers crafted from wafer paper are punctuated with hunter green geometric shapes and white pieces of a baroque frame—all handcrafted from wafer paper. For something to sip alongside this sweet confection, Good Gracious! concocted a cocktail of mountain huckleberry vodka, with a tangy touch of fresh lemon juice and lemon Chartreuse, topped with ginger ale. 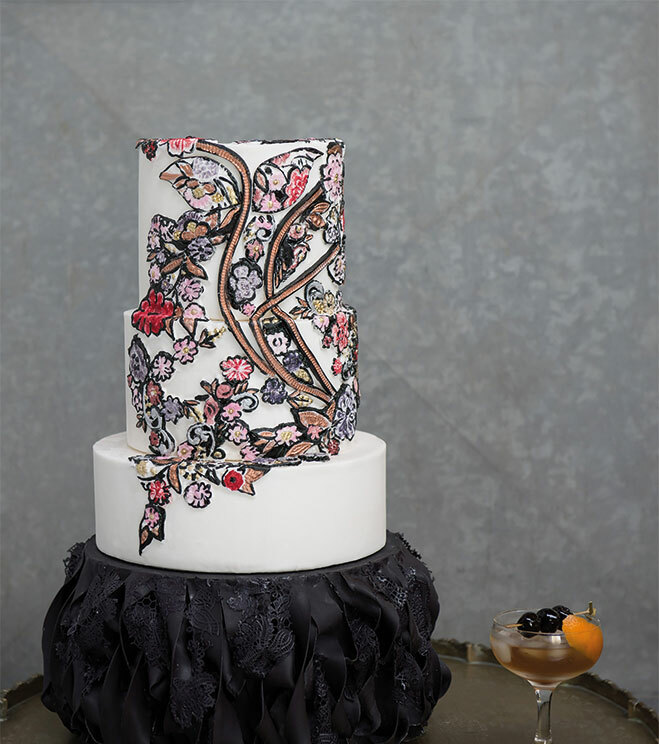 Alexander McQueen’s Spring/Summer 2016 runway show of tattered lace and couture embroidery was the inspiration for RooneyGirl’s Maria Nicoletti in designing this cake. The bottom tier features thin black strips of ruffled fondant intertwined with torn pieces of edible black lace to mimic the appearance of the disheveled and tattered lace gowns in McQueen’s collection. Fondant lace appliqué was affixed to the cake to resemble the asymmetrical style of McQueen’s embroidered top. The cake is hand-painted with a fine brush using petal and luster dusts mixed with grain alcohol. Complementing the gothic exterior, the almond-flavored cake boasts layers of blood orange buttercream and curd filling. Scarlette Bartending contributes an artisanal finish with a vanilla bourbon cocktail that features Amaro CioCiaro herbal liqueur, sweet vermouth and Luxardo cherries. Carolina Herrera’s classic clean lines and feminine style are mirrored in this delicate vanilla bean cake with a vanilla bean custard, fresh raspberries and a whipped cream cheese icing. MJB’s Melissa Booth creates a contemporary style by enrobing the cake in simple, smooth white fondant with a thin, blue cinched tier. 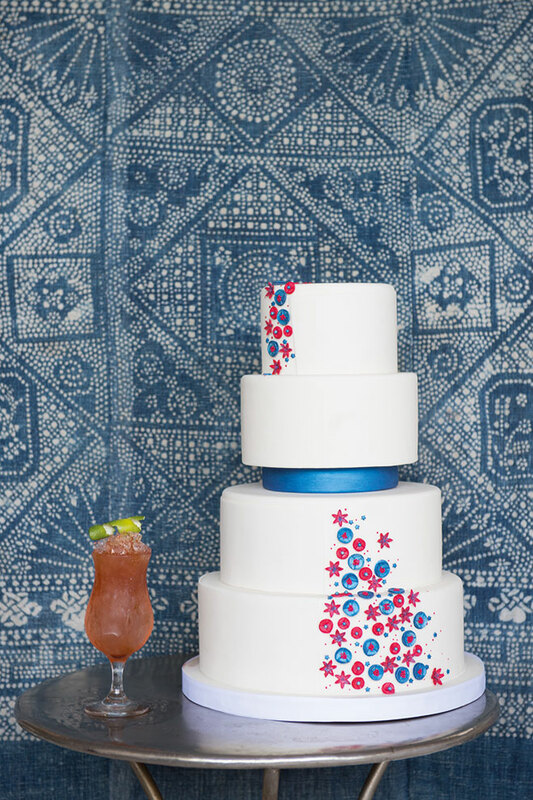 Handmade gum paste flowers in red and metallic blue form an asymmetrical design on the top and bottom tiers. A haute pairing with this cake, Scarlette Bartending’s rum punch is a blend of orange-infused Martinican Rhum Clément, lime juice, Aperol, allspice orgeat syrup and Smith & Cross Jamaican rum, finished with angostura bitters.